This brand new formulation of the ever-popular Sulphur Rose disease control powder, for the first time now available as a ready to use spray on and leave product. 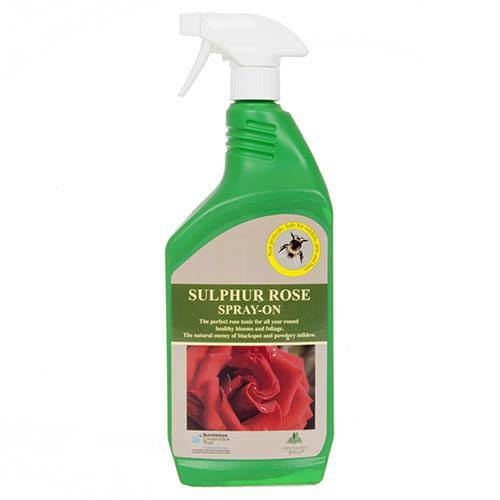 Sulphur is proven to control that old rose problem blackspot, as well as provide a tonic for improved growth and stronger leaves, which prevent other diseases like mildew affecting our roses. This 1L pack provides 40 doses - apply Monthly between March and October, so will treat 5 roses for these 8 Months. Simply squeeze the trigger and get good foliage coverage, and it will get to work straightaway as a preventaitive, so you can enjoy your roses to the maximum each year. This 1L pack provides 40 doses - apply Monthly between March and October, so will treat 5 roses for these 8 Months. Simply squeeze the trigger and get good foliage coverage, and it will get to work straightaway as a preventaitive, so you can enjoy your roses to the maximum each year. Supplied as a 1L ready to use formulation in a trigger bottle, for easy application.